The gimbri (also known as the sintir or hajhuj), is a plucked lute with three strings. The strings are tuned with a tuning noose, which can be raised and lowered to change the pitch. A metal piece, with rings, is attached to the neck of the gimbri, which produces a jingling sound audible during play. The gimbri tone is bass. 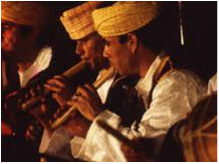 The gimbri used in Chaabi music was borrowed from the Gnawa tradition. The oud is a five-stringed plucked instrument used in music throughout the Middle East. The oud used in Chaabi music is borrowed from Andalusian music in Morocco. The western cousin of the oud is the lute. The modern kamenjah is a violin played on the knee, as shown in the picture. The violin first appeared in Andalusian music in the 1850's, and is now a common member of Chaabi ensembles. 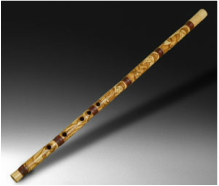 The nai (also nay, ney) is a rim-blown flute found in some Chaabi ensembles. The instrument is old, dating back at least five mellenia in the Arab world. It can be made from reed, metal, or wood. This audio player is not supported by your browser. The lira is a traditional Moroccan flute made out of bamboo. It can also be used in Gnawa ensembles. The bendir is a frame drum played with the fingers, and it usually has a snare stretched across its back (as shown in the photograph), which produces a buzzing sound when the instrument is played. It is commonly used in Moroccan Berber music. It is also found across North Africa, ancient Egypt, and Mesopotamia. The darbouka, also called the doumbek, is a single-head drum. It is played held under the arm, or held sideways on the lap. Variations of this drum are found across North Africa and the Middle East. The qraqeb (also known as karkabas) is a set of metallic castanets held in the hand. Originally made out of iron, they are now normally made out of a steel alloy. They produce a sound similar to the beat of horses' hooves. The qraqeb is commonly used in Gnawa music. Western instruments such as the piano and electric guitar are more recent additions to Chaabi groups; beginning in the 1980's, Morocco's increased contact with the Western world caused groups to incorporate more Western elements into Chaabi music.